Kids 12 and under can learn baseball skills from Spikes players & coaches! 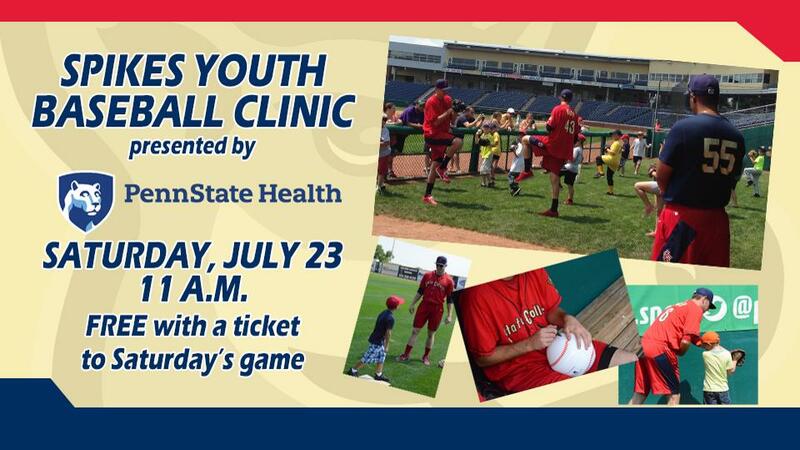 Kids can learn baseball fundamentals from the pros at the Spikes Youth Baseball Clinic, presented by Penn State Health, this Saturday, July 1. The clinic is free with a ticket to Saturday night's 7:05 p.m. Spikes game, and will run from 11 a.m. to 1 p.m. at Medlar Field at Lubrano Park. The Youth Baseball Clinic starts a jam-packed day at the ballpark, as the Spikes face the Auburn Doubledays at 7:05 p.m., on Youth Baseball Night, presented by Boyles Insurance. Plus, the first 250 kids ages 12 and under will get free 'dippin dots thanks to Boyles Insurance. It's also a Scratch n' Win Saturday, presented by P.J. Harrigan's and WOWY 97.1. Every Spikes fans will be a winner as each fan receives a scratch-off card with a great prize or discount on it, including the grand prize of 2018 Season Tickets! Tickets for Satuday's game, as well as every game on the Spikes' 2017 home slate, can be purchased by clicking here, by calling (814) 272-1711, or by visiting the Medlar Field at Lubrano Park Ticket Office.